Cincinnati Bengals quarterback Ken Anderson hands the ball off to running back Larry Kinnebrew during a 7-3 loss to the San Francisco 49ers in 1984. 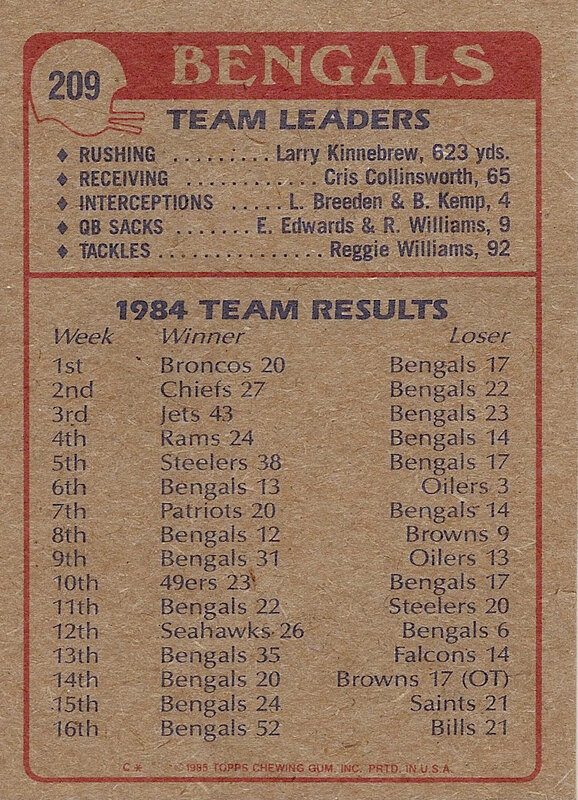 Topps’ 1985 team card for the Cincinnati Bengals may have featured veteran quarterback Ken Anderson handing off to fullback Larry Kinnebrew, however the Bengals’ offense featured a much different look that season. By the time, Cincinnati opened up the 1985 season, second-year quarterback Boomer Esiason replaced Anderson under center and James Brooks became the workhorse on the ground. The art deco style of Topps’ 1985 football card set featured Anderson handing off to Kinnebrew during a 7-3 loss to the San Francisco 49ers at Candlestick Park. That season, the Bengals finished 8-8 and second place in the old AFC Central. The next season with the new duo of Esiason and Brooks teaming with wide receivers Cris Collinsworth and Eddie Brown, Cincinnati’s 1985 first round pick, Eddie Brown, finished 7-9 (third place in the AFC Central) but laid the foundation for a franchise that would dominate the AFC for the remainder of the 1980s. Esiason passed for 3443 yards and 27 touchdowns. 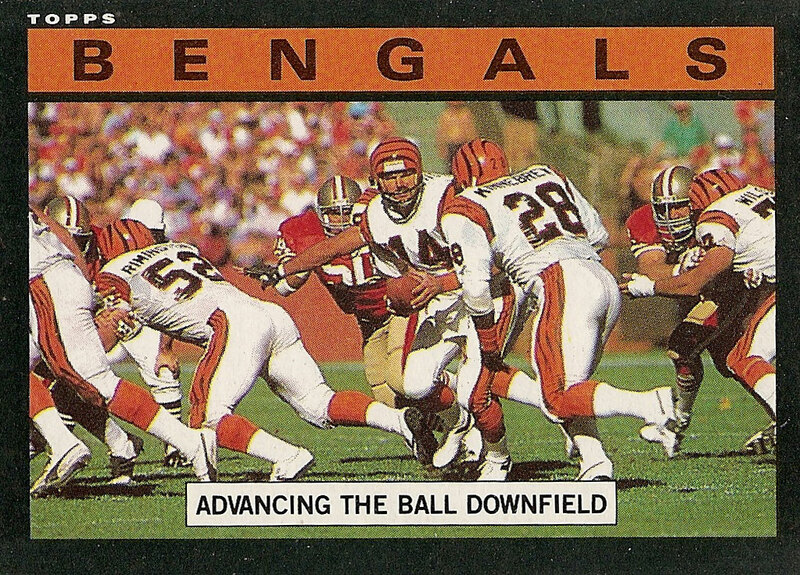 After starting one game during his rookie season, Boomer took over as the Bengals’ full-time starting quarterback on September 22, 1985 against the San Diego Chargers. His two favorite targets Collinsworth, hauled in 1,125 yards and five touchdowns, and Brown recording 53 catches for 942 yards and eight touchdowns on his way to becoming the 1085 NFL Rookie of the Year. However this duo nearly came close to not playing together. Collinsworth signed a contract that year to play with the USFL’s Tampa Bay Bandits but never played because when the receiver failed a physical due to a bad ankle. After which he returned to the Bengals. Brown was the 13th overall draft pick, out of the University of Miami, and the second receiver taken. He was also taken three picks ahead of Jerry Rice. Meanwhile on the ground, Brooks became the Bengals’ featured running back a year after coming over from the Chargers. He nearly missed breaking the 1,000 yard barrier with 929 yards and seven touchdowns on 192 carries. He also caught 55 passes for 576 yards and five touchdowns.